Sir James Douglas (also known as Good Sir James and the Black Douglas) (c. 1286 – 25 August 1330) was a Scottish knight and feudal lord. He was one of the chief commanders during the Wars of Scottish Independence. Douglas was set to share in Bruce's early misfortunes, being present at the defeats at Methven and Battle of Dalrigh. But for both men these setbacks were to provide a valuable lesson in tactics: limitations in both resources and equipment meant that the Scots would always be at a disadvantage in conventional medieval warfare. By the time the war was renewed in the spring of 1307 they had learnt the value of guerrilla warfare — known at the time as "secret war" — using fast moving, lightly equipped and agile forces to maximum effect against an enemy often locked into static defensive positions. The greatest challenge for Bruce came that same year as Edward invaded Scotland with a large army, nominally aimed at the relief of Stirling Castle, but with the real intention of drawing out Bruce and his men. The Scots army, roughly a quarter the size of the enemy force, was poised to the south of Stirling and prepared to make a quick withdrawal into the wild country to the west. However, their position just north of the Bannock Burn had strong natural advantages, and the king gave orders to suspend for a time the guerrilla tactics pursued hitherto. On the morning of the 24th June and prior to battle, Barbour states it was then that Douglas was made a knight. Many now believe that Douglas was made a knight banneret. The knight banneret was established under Edward I. A knight banneret held no command responsibilities so much as greater honours. A knight banneret fought under his own banner unlike a knight bachelor who was limited to a pennon. In his The Brus, John Barbour writes in Book XV that Douglas fought under his own banner, hence Douglas had to be a knight banneret. Barbour does state Douglas and others were knighted on the field of the Battle of Bannockburn, "each in their own degree" which would suggest not all were knights bachelor. Others believe that he was knighted late in his career. There is disagreement on the point. Traditional Scottish accounts dating from the 1370s state that during the battle, Thomas Randolph, 1st Earl of Moray commanded the vanguard, the left wing though nominally led by the young Walter Stewart was commanded by his cousin Douglas, Edward Bruce took the right wing, and King Robert the rearguard. However, contemporary English accounts state that the Scottish army consisted of three units, so the idea that Douglas and Stewart commanded a unit could be a later invention or the English account is simply mistaken. Once the English army was defeated, Douglas requested the honour of pursuing the fleeing Edward and his party of knights, a task carried out with such relentless vigour that the fugitives, according to Barbour, "had not even leisure to make water". In the end Edward managed to evade Douglas by taking refuge in Dunbar Castle. 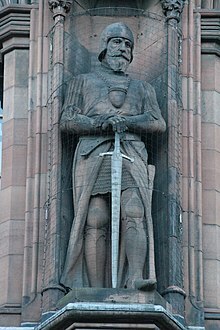 Bannockburn left northern England open to attack and in the years that followed many communities in the area became closely acquainted with the 'Blak Dowglas.' Along with Randolph, Douglas was to make a new name for himself in a war of mobility, which carried Scots raiders as far south as Pontefract and the Humber. But in a real sense this 'war of the borders' belonged uniquely to Douglas, and became the basis for his family's steady ascent to greatness in years to come. War ruined many ancient noble houses; it was the true making of the house of Douglas. The tactics used by Douglas were simple but effective: his men rode into battle – or retreated as the occasion demanded – on small horses known as hobbins, giving the name of 'hobelar' to both horse and rider. All fighting, however, was on foot. Scottish hobelars were to cause the same degree of panic throughout northern England as the Viking longships of the ninth century. With the king, Moray and Edward Bruce diverted in 1315 to a new theatre of operations in Ireland, Douglas became even more significant as a border fighter. In February 1316 he won a significant engagement at Skaithmuir near Coldstream with a party of horsemen sent out from the garrison of Berwick. The dead included one Edmond de Caillou Gascon governor of Berwick Castle, and seemingly a nephew of Piers Gaveston, the former favourite of Edward II. Douglas reckoned this to be the toughest fight in which he had ever taken part. Further successes followed: another raiding party led by Edmund FitzAlan, 9th Earl of Arundel was intercepted and defeated at Lintalee, to the south of Jedburgh; a third group was defeated outside the walls of Berwick, where their leader, Sir Robert Neville, known as the 'Peacock of the North', and elder son to Ralph Neville, 1st Baron Neville de Raby, was killed by Douglas in single combat. Such was Douglas' status and reputation that he was made Lieutenant of the Realm, with the Steward, when Bruce and Moray went to Ireland in the autumn of 1316. In April 1318 Douglas was instrumental in capturing Berwick from the English, the first time the castle and town had been in Scottish hands since 1296. For Edward, seemingly blind to the sufferings of his northern subjects, this was one humiliation too many. A new army was assembled, the largest since 1314, with the intention of recapturing what had become a symbol of English prestige and their last tangible asset in Scotland. Edward arrived at the gates of the town in the summer of 1319, Queen Isabella accompanying him as far as York, where she took up residence. Not willing to risk a direct attack on the enemy, Bruce ordered Douglas and Moray on a large diversionary raid into Yorkshire. It would appear that the Scottish commanders had news of the Queen's whereabouts, for the rumour spread that one of the aims of the raid was to take her prisoner. As the Scots approached York she was hurriedly removed from the city, eventually taking refuge in Nottingham. With no troops in the area, William Melton, Archbishop of York, set about organising a home guard, which of necessity included a great number of priests and other minor clerics. The two sides met up at Myton-on-Swale, with inevitable consequences. So many priests, friars and clerics were killed in the Battle of Myton that it became widely known as the 'Chapter of Myton.' It was hardly a passage of any great military glory for Douglas but as a strategy the whole Yorkshire raid produced the result intended: there was such dissension among Edward's army that the attempt on Berwick was abandoned. It was to remain in Scottish hands for the next fifteen years. Four years later Edward mounted what was to be his last invasion of Scotland, advancing to the gates of Edinburgh. Bruce had pursued a scorched-earth campaign, denying the enemy essential supplies, so effective that they were forced to retreat by the spur of starvation alone. Once again this provided the signal for a Scottish advance: Bruce, Douglas and Moray crossed the Solway Firth, advancing by rapid stages deep into Yorkshire. Edward and Isabella had taken up residence at Rievaulx Abbey. All that stood between them and the enemy raiders was a force commanded by John de Bretagne, 1st Earl of Richmond, positioned on Scawton Moor, between Rievaulx and Byland Abbey. To dislodge him King Robert used essentially the same tactics as that of Brander in 1308: while Douglas and Moray attacked from the front a party of Highlanders scaled the cliffs on Richmond's flank and attacked from the rear. The Battle of Old Byland turned into a rout, and Edward and his queen were forced into a rapid and undignified flight from Rievaulx, the second time in three years that a Queen of England had taken to her heels. Robert Bruce died in 1329. According to Jean Froissart, when Bruce was dying he asked that Sir James, as his friend and lieutenant, should carry his heart to the Holy Land and present it at the Holy Sepulchre in Jerusalem as a mark of penance. John Barbour, alternatively, has Bruce ask that his heart should simply be carried in battle against "God's foes" as a token of his unfulfilled ambition to go on crusade. Given that Jerusalem had been in Muslim hands since 1187, this second is perhaps more likely. When Bruce was dead, his heart was cut from his body and placed in a silver and enamelled casket which Sir James placed around his neck. Early in 1330, Douglas set sail from Berwick upon Tweed, accompanied by seven other knights with twenty six esquires and gentlemen. The party stopped first at Sluys in Flanders. There it may be that Douglas received confirmation that Alfonso XI of Castile was preparing a campaign against the Muslims of the kingdom of Granada. In anticipation, he had with him a letter of introduction to King Alfonso from Edward III of England, his cousin. Accordingly, the Scots sailed on to Seville, where, according to John Barbour, Sir James and his solemn relic were received by Alfonso with great honour. Douglas and his company joined Alfonso's army, which then was setting out for the frontier of Granada to besiege the castle of Teba. Uthman, the Berber general in command of the Moorish forces, marched to relieve the border stronghold. At some point during the siege, Douglas was killed. Sources and commentators differ as to how. According to Jean Froissart and the Gran Cronica de Alfonso XI, Douglas was killed as a result of making a premature attack on the enemy. The Gran Cronica suggests this might have been during fighting for access to water. Citing John Barbour, some modern commentators believe he died in the decisive Battle of Teba. Barbour describes a grand battle in Spain but the setting is vague and the outcome ambiguous. Uthman arrived too late to prevent a general rout and the entire Granadan force was driven back in confusion to their camp in the Turon valley, 10 miles to the south. It is in this phase of the battle that some modern commentators have placed Douglas' death, either caught in flank when Uthman's force reached the river or in the ensuing pursuit to the Granadan camp. According to John Barbour's description of Douglas' last battle, when the enemy broke, Sir James and his companions followed hard behind. Having outstripped most of his men in the pursuit, Douglas suddenly found himself far out in front with only a few of his followers around him. As he rode back to rejoin the main body, he saw Sir William St. Clair of Rosslyn surrounded by a body of Moors who, seizing their opportunity, had quickly rallied and counterattacked. With the few knights who were with him, Douglas turned aside to attempt a rescue but, outnumbered twenty to one, the group was overrun. It has become a popular legend that Douglas then took from his neck the silver casket which contained the heart of Bruce and threw it before him among the enemy, saying, "Now pass thou onward as thou wert wont, and Douglas will follow thee or die." This anecdote has its origin in a 16th-century addition to Barbour's poem which, however, describes Douglas making the gesture at the beginning of his final battle. It was Sir Walter Scott in Tales of a Grandfather who created the image of Douglas throwing Bruce's heart as his dying act. The Castilian cronica makes no reference to such a catastrophe. It does, however, state that in a fierce skirmish some days prior to the climactic battle, an unnamed 'foreign count' (arguably a reference to Douglas), had died as a result of his own rash behaviour. This is one of only two battle casualties mentioned individually in the Castilian narrative of the campaign. Barbour relates that Sir James and all the men caught with him were killed, including Sir William St. Clair of Rosslyn and Sir Robert Logan of Restalrig. Barbour states that, after this battle, Douglas' body and the casket with Bruce's heart were recovered. His bones, the flesh boiled off them, were taken back to Scotland by Sir William Keith of Galston in Ayrshire (who had missed the battle because of a broken arm), and deposited at St Bride's Church. The tradition that Sir Simon Locard was a member of the company and also survived, is not found in any of the sources. The heart of Bruce was taken by Moray, the regent, and solemnly interred under the high altar of Melrose Abbey. Archibald the Grim (b.b. 1330–1400), Lord of Galloway succeeded his once removed cousin as Earl of Douglas in 1388. By 1333 the 'bloody heart' was incorporated in the arms of Sir James' son, William, Lord of Douglas. It subsequently appeared, sometimes with a royal crown, in every branch of the Douglas family. Sir James Douglas is the lead character in author Patricia Kennealy-Morrison's novella "The Last Voyage", which is collected in her short-story compilation "Tales of Spiral Castle". Sir James Douglas is a major character in author Nigel Tranter's Robert the Bruce trilogy. The trilogy focuses on Robert the Bruce and the Scottish War of Independence. Sir James Douglas is the lead character in the novel "A Kingdom's Cost" by J. R. Tomlin. Sir James Douglas is a character in the low-budget film The Bruce. Sir James Douglas was portrayed by Aaron Taylor-Johnson in the 2018's film Outlaw King. The film is a historical action drama, focusing on Robert the Bruce and the Scottish Wars of Independence. "The Black Douglas" is an export market scotch whisky named in his honour. A popular real ale from the Broughton Brewery in the Scottish Borders also bears the name "Black Douglas". It carries the descriptive note, 'Dark and Bitter'. "The Black Douglas" is a song that first appeared on the Corries' album, A Little of What You Fancy. "Black Douglas" was the name given to British Rail locomotive 87030. ^ A. A. M. Duncan, " Douglas, Sir James (d. 1330) ", Oxford Dictionary of National Biography, Oxford University Press, 2004. ^ Ronald McNair Scott, Robert the Bruce, King of Scots, Peter Bedrick Books, New York, 1989, p 157. ^ Barbour, The Bruce, p 264. ^ I.M. Davis, 'The Black Douglas', 1974. ^ "The Man, the Shield, the Legend". The Black Douglas. Retrieved 2 Sep 2016. Barbour, John, The Bruce, trans. A. A. H. Duncan, 1964. Barbour, J., The Brus ed.Mackenzie, W.M.. London 1909. Bower, Walter, Scoticronicon, ed. D. E. R. Watt, 1987-96. Calendar of Documents relating to Scotland, ed. Bain, J. Vol III, AD 1307-1357. Edinburgh 1887. Chronicle of Walter of Guisborough, ed. H. Rothwell, Camden Society, vol. 89, 1957. Edward III and his Wars: Extracts from the Chronicles, ed. W. J. Ashley, 1887. Fordun, John of, Chronica Gentis Scotorum, ed. W. F. Skene, 1871-2. Gray, Sir Thomas, Scalicronica, trans. H. Maxwell, 1913. Lanercost Chronicle, trans. H. Maxwell, 1913. Palgrave, F. ed. Documents and Records Illustrating the History of Scotland, 1837. Vita Edwardi Secundi, ed. N. Denholm Young, 1957. Barrow, G., Robert Bruce and the Community of the Realm of Scotland, 1976. Barron, E. M., The Scottish War of Independence, 1934. Brown, M, The Black Douglases: War and Lordship in late Medieval Scotland, 1998. Davis, I.M., The Black Douglas, London 1974. Maxwell, Sir Herbert, A History of the House of Douglas II vols. London 1902. Ross, David R., James the Good:The Black Douglas. Glasgow 2008.